Oakland residents can take steps to protect their communities in the face of climate change impacts. Are You a Climate Change Survivor? 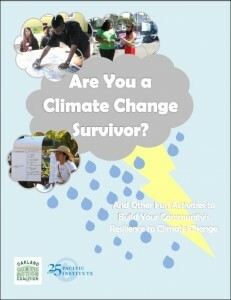 is the fun new activity workbook, game, and handy fact sheets from the Pacific Institute and Oakland Climate Action Coalition (OCAC) that provide engaging activities to raise awareness about climate change impacts like heat waves, flooding, and poor air quality – and the tools that community members can use to build safety and resilience. From “Climate Justice Human Bingo” to “Community Resilience Lifeboat,” the projects, games, and discussions in the Are You a Climate Change Survivor? activity workbook provide resources and things to do that range from basic learning about climate change and how climate change affects us, to how community members can prepare and how to create more resilient communities. One activity is the board game Climate Change Survivor – the atmosphere’s version of Sorry! Community groups, community health workers and educators, church groups, schools, families, and even groups of neighbors can download the game board and game cards free online and have a great time while learning about different climate change impacts, how we might be vulnerable, and what we can do to better prepare and protect ourselves from these impacts. The activities and resources were developed by the Pacific Institute and OCAC and piloted at community meetings, events, and workshops. The focus is on creating a space where diverse people and organizations can imagine and implement solutions that protect Oakland residents as they face the local impacts of climate change, such as heat waves, floods, wildfires, poor air quality, and rising utility costs. The activity workbook is complemented by colorful Community Resilience Factsheets providing more information about how climate change will impact Oakland communities in Oakland. They include practical tips for how to protect yourself, save money, and build resilience to climate change impacts while encouraging friends and neighbors to do the same. These tools are an extension of the 2012 Pacific Institute study Community-Based Climate Adaptation Planning: Case Study of Oakland, California, which identifies social vulnerability to climate impacts shaped by a variety of factors, including income, race, health, age, English fluency, etc. If you have questions or feedback, please contact Pacific Institute Program Director Catalina Garzón at cgarzon (at) pacinst.org.